Living Links | Discover Dandenong Creek Festival – 1 week to go! 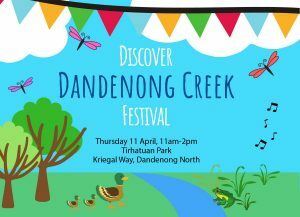 Discover Dandenong Creek Festival – 1 week to go! The Discover Dandenong Creek Festival is back! The first festival in 2018 was such a success, we’ve decided to do it again – but even bigger and better this time! Come and join us for a wild day of fun and discovery to celebrate the natural wonders of Dandenong Creek. There will be all manner of free, fun, educational and inspiring activities for people of all ages. This event is sponsored by Living Links and the City of Greater Dandenong with funding from the Victorian Government.